Saturday, July 28, 2018, noon – 3 p.m.
DWPC is pleased to partner with the Denver chapter of Las Comadres Book Club, an international web-based book discussion group that focuses on Latina/Latino literature. Thanks to DWPC member Juana Bordas, Las Comadres will hold their July discussion event at our clubhouse, with a special invitation to our members to attend. 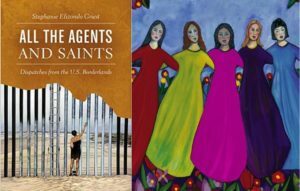 The book that we will discuss is All the Agents and Saints: Dispatches from the U.S. Borderlands by travel writer Stephanie Elizondo Griest. This timely work of non-fiction “explores contemporary borderlands in a way that both breaks the heart and heals it. A stunning book with an urgent message of peace for our times.” –Ruth Behar, author of Traveling Heavy and Translated Woman.